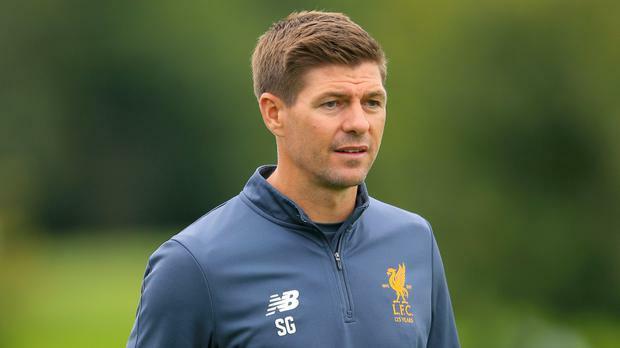 Former Liverpool captain Steven Gerrard insists the "madness" of Premier League management has not diminished his long-term goal to join the ranks of top coaches. The 37-year-old's fledgling coaching career has begun well having guided the Reds' under-18 side to the top of the table and into the knockout stages of the UEFA Youth League. Gerrard is under no illusions as to how big the step up to top-flight management is, and the sackings of Paul Clement (Swansea), Tony Pulis (West Brom), Slaven Bilic (West Ham), Ronald Koeman (Everton), Craig Shakespeare (Leicester) and Frank De Boer (Crystal Palace) this season have shown how quick clubs are to make a change when things do not work. He has no such pressure in his current job, but knows as he moves up the ladder – and he harbours dreams of managing his boyhood club somewhere down the line – the demand to deliver consistent success becomes far greater. Gerrard is also not fazed by what is perceived as a blockage for young coaches created by the likes of experienced campaigners such as Roy Hodgson, Sam Allardyce, Alan Pardew and David Moyes still being given jobs despite previous failures. "I don't get put off by managers getting sacked. I just think my journey will be what it will be," he said. "Right now I'm only thinking of the next 18 months to two years and getting myself as prepared as I can be for a job closer to first-team level. "For me it was important to get a taste of it away from the cameras and the spotlight and, first and foremost, experience all these things before you go into the madness. "I don't think I have to rush into over-thinking what is next and look what's out there for the next thing. "I'm not looking at David Moyes coming in at West Ham or Sam Allardyce at Everton. "I'd be wasting my time thinking about those situations at the moment because they are way further down the line. "I want this to be the start of the journey. Nothing is putting me off or scaring me about being available for jobs in the near future." Gerrard would dearly love to continue his progress through the ranks at Liverpool but accepts he may have to sever his ties to get the break he needs. "In a year's time I might have three opportunities and all three of them might not be here. Then it will be time to think," he said. "I can't sit here and say to you, 'Oh no, I only want to work for Liverpool Football Club'. "In an ideal, perfect world, everyone knows what I want, but right now it's not worth thinking about that." The former midfielder admits coaching has only partially helped fill the huge void left by his retirement from playing. "I don't think anything can fill it. I do miss playing," he added. "I'm not one of these players that played for a career just because I was good at it. I loved every day of playing, I loved the game. "I knew during my career I was going to have a period where I would miss it really bad. I found it very difficult to get over the fact that my playing days were gone. "I'm in a better place in terms of that now. I've moved on from it, but I'd love to be a player again. I loved every minute of it."